The dust kicked up by thousands of hooves and hundreds of wagon wheels swirled before the oxen's snorting nostrils as the wagon train lurched forward. As they started their heavy wagonloads of trade goods down the Santa Fe Trail for the day's journey, the teamsters kept one eye on the horizon, wary of the threat of Indian attack. After splashing across the Pawnee Fork, the wagons rolled across a gentle plain of prairie grass that rippled like water in the breeze. Ahead, the rising Kansas sun illuminated the crackling red, white, and blue of the Stars and Stripes standing high above the prairie. 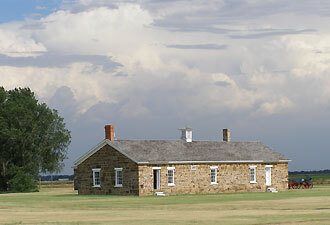 Fort Larned, placed here in western Kansas, was a welcome sight to the travelers. For 19 momentous years, Fort Larned protected U.S. interests on the Santa Fe Trail in a time of sweeping change. Here, veteran commanders including General Winfield Scott Hancock and Lt. Col. George Armstrong Custer had their first encounters with American Indians and blundered into a state of war in 1867. At that period, Fort Larned played a vital role in offering peace to the Southern Plains tribes as an Indian Agency. The fort stood at a cultural crossroads, where American and Mexican civilians, American Indians, and a multi-ethnic army tried to come to terms with one another. Today, Fort Larned remains a vivid and tangible reminder of this difficult time in our nation's past. It is the best-preserved frontier military post in the American West. Nine historic sandstone buildings line the five-acre quadrangle, each carefully furnished as it was when the fort was active. You may get a sense of being thrust back into the 1860s and 1870s as you tour the site with a ranger or on your own. As you walk through the historic buildings, you might smell coal smoke and hear hammering coming from the blacksmith shop; interact with living history staff and volunteers who portray soldiers, ladies, and civilians on post; stroll the nature trail; or pause to reflect on the hardships endured by the traders, settlers, soldiers, American Indians, and families who were here in the past. Tour the visitor center and museum to see historic artifacts and learn more about Fort Larned's story. You can also travel about 5.5 miles to view historic Santa Fe Trail ruts. 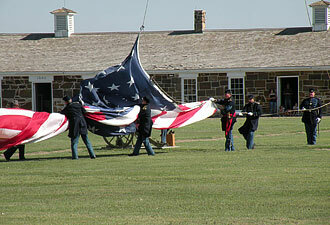 During special events, Fort Larned bustles with activity with the help of dozens of volunteers, who provide a unique opportunity to experience a working frontier fort. 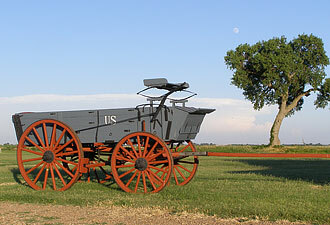 Fort Larned National Historic Site is located in western Kansas, six miles west of Larned, KS, on Kansas Hwy 156. Fort Larned is open year-round, seven days a week, except for Thanksgiving, Christmas, and New Year's Day. Admission to the site is free. Tours for groups are available year-round with reservations. For more information, please contact us.